Use the category index at the left, or just scroll down to browse all our videos. 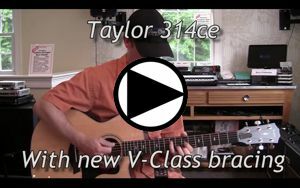 Taylor's workhorse 314ce has been updated! This professional-level acoustic-electric now has Taylor's new V-Class bracing that adds even more clarity, ring and sustain. With its great-sounding and reliable ES2 electronics, this guitar is truly ready for the stage. And it's still under $2,000! Taylor fans, get ready... 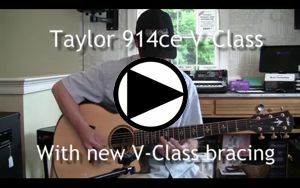 The new Taylor 914ce V-Class is shipping - and WE HAVE ONE!! Not only does it have Taylor's new premium V-Class bracing, this guitar stands out with its elegant paua/koa/paua inlays and purling and ebony binding. The solid Sitka spruce top along with the solid Indian rosewood back and sides gives this guitar a 'clearer-than-water' tone. Come try it out for yourself! 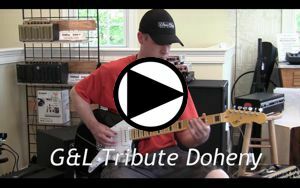 The G&L Tribute Doheny is here! Another awesome G&L from the Tribute series, named after the famous beach, this guitar's Wide-Bobbin M.F.D. pickups deliver that 'surf' sound you're looking for. 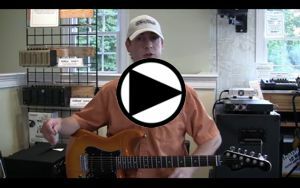 Unlike a Jazzmaster, the Doheny's Dual-Fulcrum vibrato is sure to stay in tune no matter how deep the dive! Small body, classic woody tone! The Martin OO-15M is a popular comfortable small bodied guitar. Its solid mahogany body gives it the classic woody tone that Martins are known for, while the 1-11/16 inch nut coupled with the low-oval neck profile feels comfortable in the left hand. We can order it as a lefty too! Offered at $1,299 in a hardshell case. Warm tone, full bodied dreadnaught sound. The Seagull Coastline Momentum is an affordable guitar, with the warm rich tones of a solid Canadian cedar top. Priced at $599 in hard case, or $560 in a semi-rigid bag. 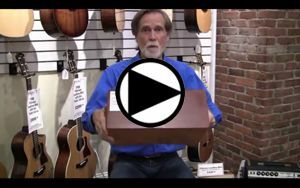 Another from our mini-series on shopping for the right guitar, this video covers the differences between nylon stringed classical guitars, and steel stringed standard acoustics. Whichever you prefer, we'll find the right guitar for you! Solid wood construction can affect the pricing on an instrument by a lot, but the most important piece of wood on a guitar is the top. Listen to these three dreadnoughts and you'll notice the difference in price is reflected in the tone. The G&L Tribute line offers a lot of variety in mid-range electrics. We have two ASAT's (one Classic and one BluesBoy) as well as a Legacy and an S500. 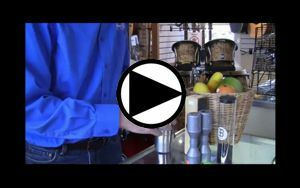 Each has its own unique qualities as you'll hear in this short video, but don't forget to come in and try them for yourself!. 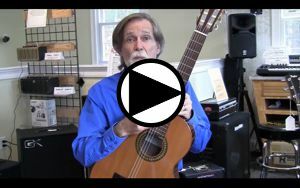 Do you play the classical-style nylon-string guitar? 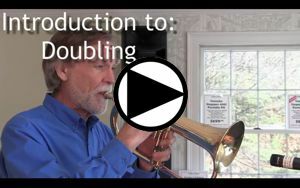 Need a way to practice without bothering others? Or travel more easily with your instrument? 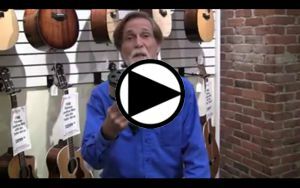 The Yamaha Silent Guitar is just what you need! If you're a solo artist, lead player, or just someone who wants a little more out of your acoustic, then the Yamaha LS-TA is for you. With an all solid wood concert-size body and ebony fret board, it's already a great guitar. Then Yamaha adds an electronic actuator that adds tasteful chorus and reverb effects without requiring an amplifier or effects pedal. Listen for yourself and hear the difference! Wow - another custom G&L S-500 with cool features! Aside from the desirable color and ebony fret board, it has a mini toggle switch producing five extra tone combinations. Give it a look! The ultimate travel guitar! 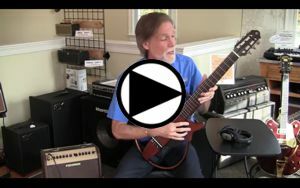 In this 6-minute video, Carl demonstrates the amazing Journey OF660 travel guitar. Carbon fiber durability, great sound, and it breaks down to fit into a backpack. Don't buy a travel guitar until you see this one! 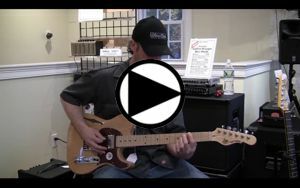 Zach Smith, store manager at The Minor Chord music store in Littleton, MA demonstrates how to properly restring an electric guitar. 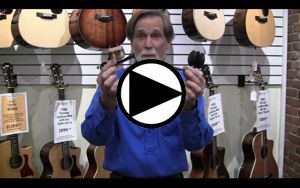 Zach Smith, store manager at The Minor Chord in Littleton MA, shows you how to replace the strings on your steel string acoustic guitar. WHAT'S A CAJON? 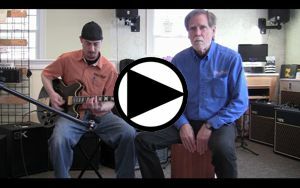 Check out this short video - Zach plays a nice riff on guitar, then Carl sits in on cajon while Zach plays the same riff again. What a difference! It's like a drum kit in a box. 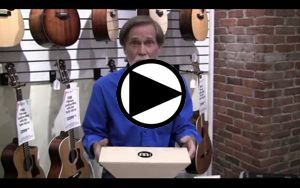 And they're affordable - most of our cajons are in the $100-200 range. 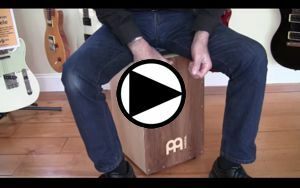 If you're looking for a wide range of percussive sound out of one instrument, this take on the Cajon is sure to please! It combines traditional Cajon sounds with the brighter sounds of bongos to form a percussive Swiss army knife. Give it a listen. If you're looking for a big kick drum sound out of a small package, the Meinl Bass Box is perfect for you! 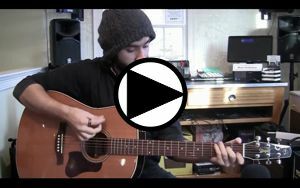 Give it a listen, and come try it yourself. Looking to add sizzle to your rhythm? Starting at $19.99 the Cabasa adds just that! Durable, good tone, and inexpensive. What instrument did I just describe? If you guessed "Bongo Cajon" you'd be right. Have a listen and hear why! If you're looking to add some energy to your music, consider these Meinl Heel Shakers and Jingles. They add a layer of depth to your sound for under $20! We have a new childs percussion kit from Nino in this week, perfect for children 3-6 years old. Check it out! 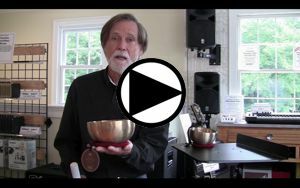 The singing bowl's resonant tone is often used to impart a sense of calm and achieve deeper meditation. You may have seen them in meditation class or yoga studios. We just received a HUGE shipment of Meinl percussion including a lot of cool new items. 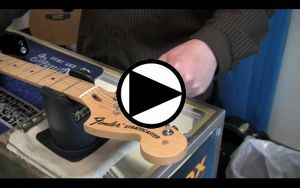 Here's a video of us opening boxes and trying out some of the really interesting ones. It felt like Christmas in April! 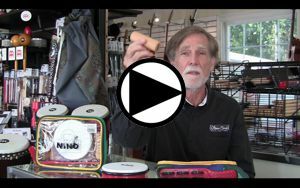 If you're new to percussion, a shaker is a great place to start. 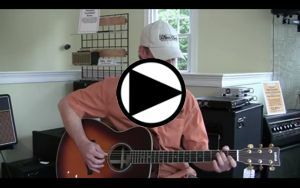 Easy to play, inexpensive and they add a lot of energy to your music. 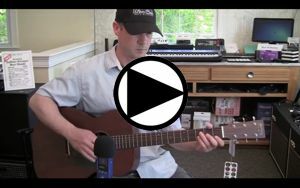 In this short video, Carl gives you three quick tips for getting the best sound. We have dozens of shaker styles in stock - come in and try some! We think percussion is more than just shaker eggs - so we've stocked the best selection of quality Mienl percussion in our area. 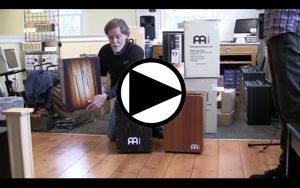 Here's Carl in a short video demonstrating the increasingly popular 'cajon' (Peruvian box drum). Double without breaking the bank! 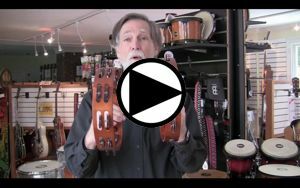 Do you want a second instrument for those featured parts & solos? 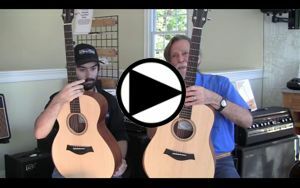 Check out some of our quality, affordable instruments to double on. It's almost time to go back to school and that means back to music! Shopping for a band instrument? In this short video, Carl explains some features to look for. The Minor Chord has quality student instruments for sale or rent at very competitive prices. 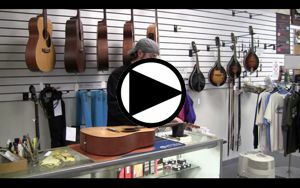 Just starting and need to choose an instrument? Come in and try them all! 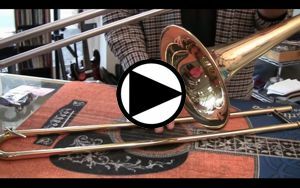 The Folks at Yamaha have recently come up with a nifty invention: The Silent Brass system. 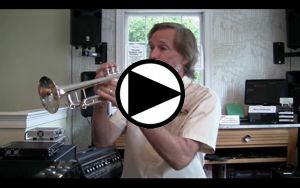 It combines a practice mute with an microphone/amplifier to allow brass players unobtrusive practice anywhere in the house. Listen and hear the difference yourself! 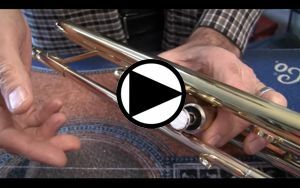 Carl Strathmeyer, trombone player and teacher at The Minor Chord Music Outfitters, explains how to clean and lubricate a trombone slide. 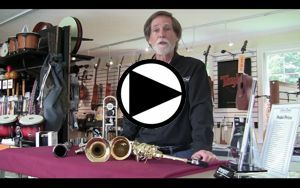 Carl Strathmeyer, owner of The Minor Chord Music Outfitters in Littleton MA and a brass player, explains how to get your your trumpet ready to play. 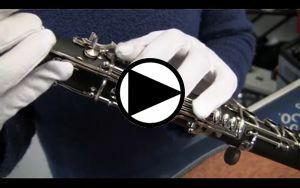 Andrea Strathmeyer, repair technician at The Minor Chord Music Outfitters, explains how to take care of your clarinet. Curious about a product? 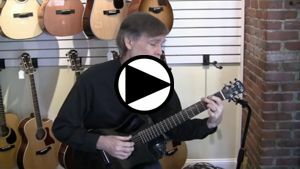 Looking for advice about a playing technique? Questions about how to take proper care of your instrument? If you are puzzled, chances are others are too. We'd love to put together a video that answers your questions. Use our Ask Us page to send in your suggestions.